Select Door & Window PositionDoors in Middle of Front Reverse Apex. Windows Either SideDoors to Left of Front Reverse Apex. Windows to Right of DoorsDoors to Right of Front Reverse Apex. Windows to Left of DoorsNON-Standard or Not Sure. See Shed Configuration Below or Call Us. We Would Always Confirm Your Choice in Email. These Platinum Apex Sectional Buildings – Too Good to be True? Looking for How and Why To Choose? Here Are The Reasons You Should Select This Platinum Reverse Apex Workshop for Your Garden. When choosing a new wooden workshop or garden storage workshop you need to do a lot of homework (a little like being back at school) to ensure that your new building will meet your needs in terms of quality, construction and value. As well as that the appearance is important. It needs to look good if you are to have it in YOUR garden. This is where these Platinum Southampton sectional buildings score. Naturally good looking and displaying strength, however, you will find these reverse apex workshops particularly good looking. Their wide front apex side gives an appearance of a summerhouse meaning you get strength and good looks – like a Hollywood star – which can’t be bad. Choosing this building will make working in it a pleasure and make you feel proud of your choice. These Platinum Southampton Reverse Wooden Workshops for the garden are some of the nicest looking and finest buildings we offer. Their appearance alongside the meticulous attention to details makes it very desirable. Taking into account the diagonal bracing in the walls, the vents in the soffits (underside of the roof) which allow air to circulate freely and the heavy duty barn-style double doors you can appreciate the quality of these sectional buildings. Available in a range of T&G redwood deal (NOT inferior whitewood) claddings from 15mm through to 20mm (finished thickness), solidly constructed and combined with 19mm (15mm finished thickness) floor. Also, the roof is made from T&G ‘proper’ timber – unlike other companies like Tunstall Garden Buildings and others who use cheap OSB board – and has long-lasting Onduline boarding means you can see this is a serious building. It hard to imagine how good these transverse apex wooden workshops are so take a look at our show site and judge for yourself. When spending money on a new sectional building or garden storage workshops it’s good to be sure of what you will get however in these days of the Web you will find that most Internet companies don’t offer an option to see beforehand. They believe that a flashy web site and glossy brochures are good enough well, in my view, it’s not. You should always have the opportunity to see first hand what you are buying, or at the very least examples from the manufacturer’s range. This will give you a true feel for the product in question. We have display sites where you can see these wooden workshops for yourself. It makes good sense to either view your proposed new building or at least deal with a company which has the confidence to display their products for all to view. At least this way you can have peace of mind in the company concerned. Many companies claim you can build these buildings yourself, which you can. however, the fact is that this can be hard work. Besides the hard work involved it’s also crucial that these sectional buildings are put together correctly to ensure the longest life for your new building. The Platinum Southampton sectional workshops come with free installation or erection AND there is NO extra charge for this – how good is that? Why wear yourself out or risk not building your new workshop correctly – take advantage of this service and put your feet up. Delivery of these buildings is also included to most of mainland England. Delivery charges to other areas. Rust Resistant Fittings & Nails. Cladding: Normally clad in T&G Shiplap, with standard thickness being 19mm nominal (15mm finished size) which is thicker than most other. Also available in 20mm Loglap T&G cladding OR 23mm to 6mm Rebated & Lined Weatherboard on these sectional buildings. All timber is redwood deal not cheap inferior whitewood. Tanalised pressure treated as standard with 15 year minimum expected life against rotting. Screwed together construction. Framing: Standard Timber workshops framework size is 70 x 33mm thick (3″ x 1½” nominal) on all buildings. Effectively thicker in corners when erected. All framework screwed together in corners, not just nailed together. Diagonal bracing in all corners for long term stability. Fully pressure treated. Designs: These Platinum Southampton Transverse are made with an gable or apex style roof. Other names for this style of roof is ‘v’ shaped roof, pointed roof, ‘saddle back’, pitched roof or angled roof. If you require a pent roof (single slope) then take a look on this page or for the standard apex roof on this page. Roofs: These transverse apex workshops roofs are made from solid 16mm (12mm finished thickness) T&G timber and covered with the superb Onduline roofing sheets. These roof sheets are designed for very long life these roof sheets as the expected minimum period against leaking is 15 years. (no chipboard, sterling board, OSB board or sheet materials are used – as these are unsuitable for outdoor use.) Option for gutters and downpipes to conserve that precious water for your garden. Vents added in the soffits (underside of the roof) to allow for free flow of air. Option for green mineral felt, if you choose. Floors: As standard the extra strong heavy duty floor is made from 19mm (15mm finished size) T&G timber boards set on 50 x 45mm (2×2 nominal) pressure impregnated joists for long life. 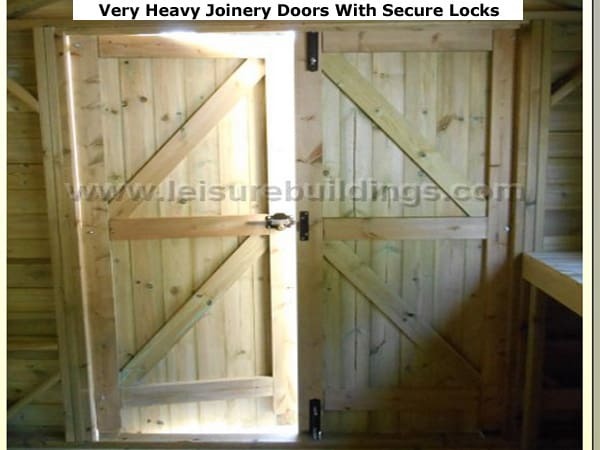 Doors: Barn like fully framed joinery quality 44mm thick heavy duty Doors as standard. One pair of fully boarded doors hung on fully galvanised hook and band hinges and complete with long throw 5 lever security lock and lever furniture. Beware of sectional garden workshops doors with NO bracing. Windows: 3mm clear TOUGHENED glass bedded in clear silicone is used on these superb workshops windows. (Not cheap scratchable plastic or perspex). All these Southampton transverse apex garden workshops include at least one opening window, which is top hung with 2 t-hinges and one casement stay. Option for security windows or windows with bars. The number of windows varies according to the size of the building. Corner Strips: These Platinum Southampton Transverse apex garden workshops are completed with ‘Wrap Around’ corner strips. These offer extra protection to the end grain of the timber and for a smarter finish. Just another small features which goes into these buildings but shows that a lot of thought has gone into these superb garden buildings. Height: Internal eaves height is a generous 1.95m (77in) eaves on all sectional buildings. Normal ridge height is at least 2.35m (92 inches) which is less than 2.5m if you have planning issues. Please check before ordering if heights are crucial in connection with planning. Treatment: As standard these garden workshops and sectional buildings are treated completely with pressure treated Tanalith. Peace of mind included. Although the timber is protected against rotting it’s important that you apply a coat of waterproof treatment within 3 months of delivery to ensure the fullest life for your new building. Nails: All fittings and nails are all galvanised or rust resistant to ensure long lasting good appearance to your workshop. NO staples are used as these are not suitable for a quality heavy duty building. Insulation: If you wish to use these all year round then consider the optional lining and insulation. Cooler in Summer. Warmer in Winter. Erection: All our transverse apex sectional garden buildings are installed FREE of charge. You need to provide a solid level concrete or paving slab base or timber decked area, or maybe it could be built on your timber bearers for your new garden building to go onto. There is also an option for building a timber raft for you. Buildings are secured using screws for ease of taking them down again if you decide to move. Optional Extras: These include double or wider doors, extra windows, extra height, lining and insulation, partitions, gutters and downpipes etc – please ask. Delivery: FREE delivery is included to most of England (mainland). Outside of this free delivery zone it is often possible to deliver and assemble these transverse apex garden workshops for a small surcharge. Bespoke: Any size or bespoke design of transverse apex garden workshop or sectional timber building to suit and can be made with extra doors, windows or partitions. If not sure please contact us for your personal bespoke quote for your precise needs. Viewing: View these superb garden storage buildings before buying if you wish so you can inspect at first hand the high quality of the materials used and the construction methods. Show sites near Woking, Farnham and Guildford in Surrey. Please check which models are on site before visiting to avoid disappointment. Support UK: These Platinum Southampton Transverse Apex Heavy Duty Garden Workshops are made in the UK by experienced craftsmen. Back our British workers. Sizes: Unless specified as finished size then sizes quoted are before machining which reduces the size quoted by about 3mm. BEWARE. Many sectional garden workshops manufacturers quote BEFORE machining sizes making them APPEAR larger – don’t be fooled. When buying a garden shed it’s important that you have a building which will suit you and your garden so rather than compromising we offer a very large range of styles which should suit all situations. However, if our standard styles of sheds don’t fit YOUR bill please let us know and we will endevour to accommodate you. After all, it is YOUR new shed so you should call the shots, so to speak. We have a simple system for styling. The first letter is the first letter of the supplier’s name (i.e. D for Diamond, S for Sapphire etc). The second letter is the type of roof so A for Apex and p for Pent. The final letter is the actual model. Model *PB is a pent building where the door and windows are both on the same HIGH side of the shed. The door is set to the RIGHT and the window to the LEFT. There are no door or windows on the pent end. The size of the shed will determine how many windows there will be. The model *PC have both the door and windows on the HIGH side of the building. The windows are set to the RIGHT with the door alongside to the LEFT. The pent end of the shed is all timber. The number of shed window varies according to the size of the building. Shed model *PD is a pent style building. This has the door on the PENT end of the building. The window is on the RIGHT hand HIGH side of the shed as you go in the door. The amount of shed window varies according to the size of the unit. This shed model has the door on the short PENT end of the building and the window on the LEFT LOW side of the unit. The number of windows varies depending on the size of the shed. This model *PF also have the windows on the LOW side as you go in the garden shed. As you go in the door, which goes on the short PENT end, the windows will be on the RIGHT hand LOW side of there building. This *AI garden shed has an APEX roof and with the door on the APEX end of the building. As you go in the door the windows will be on the LEFT hand side of the unit. The number of windows varies with the size of the shed. This *AJ APEX roofed garden shed has the door on the APEX end of the building. As you go in the shed door the windows will be on the RIGHT hand side of the unit. The number of shed windows varies with the size of the building. This *AG garden shed has the door and windows on the LOW side of the building with the door set to the RIGHT and the windows to the LEFT, also on the LOW side, as you look at it from outside. Nothing on the APEX ends. Bear in mind that as the door and windows are on the LOW side then the door may be lower than standard. This *AH APEX roofed garden shed has the door and the windows both on the LOW side of the building. The door is set to the LEFT and the windows to the RIGHT. This is looking at the shed from outside of the building. The number of window varies according to the size of the shed. Don’t forget that as the door and windows are on the LOW side then the door may be lower than standard.